The USPS employs over 600,000 people nationwide, delivering over 660 million pieces of mail every day. Despite this enormous volume of mail, the post office has integrated modern tracking techniques into every aspect of its work, allowing customers to specify where they want their packages to be delivered, and to know when they arrive down to the exact second. The USPS tracking system is one of the most advanced and user-friendly in the US postal market. Customers can choose to set up as many as 11 different tracking stages via the firm’s end-to-end service. USPS provide a text alerts system to inform customers when their packages have been delivered, and where they can be found when delivery has failed. Customers can also provide detailed information to USPS staff regarding delivery instructions, to avoid any problems when their packages are delivered. 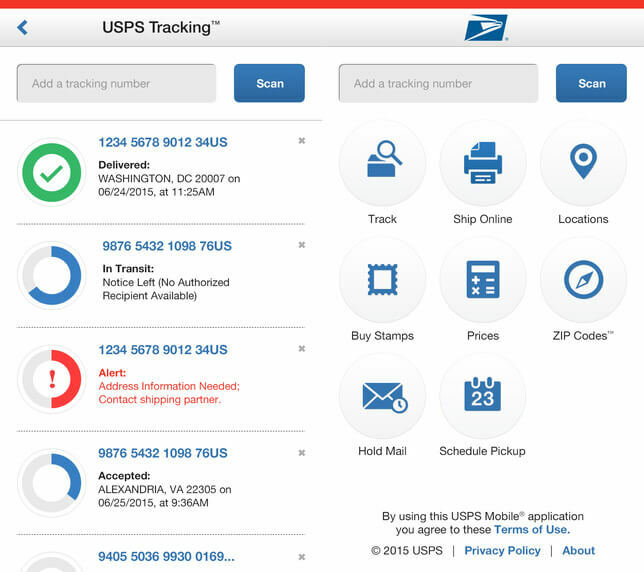 USPS offers tracking services across a wide variety of formats. These include conventional certified mail, collect on delivery, global express guaranteed, priority mail express international, conventional priority mail express, priority mail, registered mail, signature confirmation and USPS tracking. Individual customers can manage all aspects of their tracking via USPS’ dashboard system. All that they need to do is register online or via mobile devices, verify their identity and they will have access to real-time information about any packages being delivered via USPS. Identity verification provides security, minimizing the dangers of identity theft. Clients can use their dashboard to specify delivery instructions, they can schedule a convenient time for redelivery should any problems arise and they can even create their own custom shipping labels. Any notifications will be delivered in accessible formats and full information is provided about each package at every stage of the delivery process. If customers leave town, the USPS hold mail service will also allow them to safely store their packages until it is convenient for them to pick them up. Business customers have a different range of tracking options. They can also use the USPS mobile app, as well as the click-and-ship function, which allows business customers to easily print batches of labels and arrange for postage costs online. Batch shipments can be arranged with up to 20 identical packages, and USPS will arrange for both domestic and international delivery, while payment can be via credit card or using Paypal. The USPS also offers a service called Business-Pro. Business-Pro caters for businesses that need to send larger volumes of trackable mail. It suits those who need to mail out at least 50 packages weighing over 50 lbs in total. USPS will provide a suite of desktop or mobile-enabled software to assist Business-Pro clients when compiling their orders, and postage can be paid via electronic manifest files. There are also specialist services for direct mail-based companies. If they need to produce leaflets, advertisements or brochures, USPS provides business advice about the available formats and how to plan an efficient direct mailing strategy. With the tracking services provided by USPS, customers can also choose to intercept and redirect a package that is en route to its destination. At a small extra charge, packages can be located and redirected using the firm’s online tracking systems, allowing it to be sent to a completely different address or held at a local post office for collection. The dashboard tracking system has been fully optimized for use with mobile devices. Under the “your post office anywhere” slogan, USPS has changed their site to enable mobile users to easily manage their delivered wherever they are in the United States. All of the tracking services are delivered straight to mobile devices – and there is no need to re-enter tracking numbers every time you need to check on the location of a shipment. This cuts down on the time needed to keep track of packages and makes the whole process much more user friendly. In a sense, the United States Postal Service is older than the country itself, tracing its roots back to 1775 when Benjamin Franklin was appointed the very first Postmaster General at the Second Continental Congress. Under pressure from newspaper owners who needed a way to distribute their writings across the territory, the founders of the United States made clear in the Constitution that the Post Office would be a key part of the future nation. From that point on, the USPS became a key part of the expansion of the United States. It helped to keep the population informed about new laws and developments elsewhere. It stimulated commerce, allowed families to stay in touch across vast distances and provided a familiar presence in every single American community. By 1840, the Post Office was carrying almost 3,000 letters per head of population and employed 14,000 people across the United States. This only grew as the railroads expanded, increasing demand for mail everywhere they went. A class of workers emerged that was based in railroad cars, where they sorted over 600 pieces of mail every hour, frantically trying to have everything in place when delivery locations came around. In the 20th century, the USPS came to occupy a special place in the American national story. Laws were passed that made it extremely cheap to mail anything, anywhere in the nation. People took advantage of this, sending vast volumes of mail to isolated communities and the big cities alike. Mail order businesses flourished, helping to kick-start American capitalism, and services like Airmail started to develop as well. Nowadays, the USPS remains an independent department of the Federal Government. It has the responsibility to deliver and sort all mail or packages, along with retailing stamps and mailing supplies. As of 2012, it had an operating budget of around $78 billion, and operated over 30,000 separate places of business. The USPS is run by a Board of Governors. Nine out of the 11 governors are appointed by the President and then confirmed by the US Senate. These governors then appoint a Postmaster General and a deputy, completing the full portfolio of governors. Alongside the Board, the USPS also operates an Independent Office of Inspector General, which is intended to scrutinize the operations of the Post Office. This office was created after widespread allegations of inefficiency and corruption within the huge bureaucracy of the USPS, and the Inspector General now employs over 1,000 agents across the country, ensuring that corruption and criminality are prevented. Divisions of the modern Post Office also include the Army Post Office and the Fleet Post Office, which supply American servicemen and women with post wherever they are stationed. The most recent financial figures from USPS showed that the firm had suffered losses of $1.5 billion in the first quarter of 2015. That decline was blamed on the reduction in the number of first-class packages and letters processed by the Post Office. However, USPS reported a 14.4 percent increase in the volume of packages being shipped, contributing $223 million to its revenues. This reflects current efforts to specialize in catering for e-commerce firms that rely on regular, reliable postal services. Since 2006, the Post Office has been Congressionally mandated to pre-fund its employees’ retirement health care plans. This has led to regular deficits, as the USPS receives no tax money from the Federal Government. Instead, it relies upon revenues generated by its business operations. Analysts say that before the USPS was required to prefund retiree benefits, its operations were profitable and debt-free. Since then, the service has sustained losses of $51 billion, $43 billion of which is attributed to funding retiree health needs for the next 75 years. This has meant that the USPS has increased its debts to $15 billion, from almost nothing in 2005. USPS supports a number of charities and offers a special rate for non-profit mailers. This applies to most charities, who need to apply for eligibility directly to the USPS. The USPS also runs its Stamp Out Hunger food drive, which takes place in May and sees postal workers appealing for food donations from their customers. Other charitable initiatives include attaching missing persons appeals to commercial circulars, provision of educational materials to schools and promoting the enrolment of staff members in the national registry of bone marrow donors. Sustainability is a key concern of the USPS, which runs the Blue Earth campaign to increase recycling across the organization, and to minimize waste. This includes specific recycling services for companies and Federal bodies, as well as cash-back offers for some recycled items. 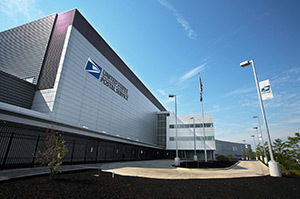 USPS is the third largest employer in the United States after retail giant Wal-Mart and the Federal Government itself. This means that there are plenty of career opportunities available within the organization. USPS operates a graduate program for prospective management professionals, as well as a 10-week summer internship program. The Post Office also includes 85,000 former or reservist service people in its ranks, and runs a Military Transition Program for service people and their families. There are a wide variety of different job roles on offer at USPS. The firm is always looking for automotive engineers, city carriers, industrial engineers, mail handlers, rural carriers and tractor operators, along with management professionals. An eCareer portal provides a simple way for potential employees to submit their applications for any available positions.